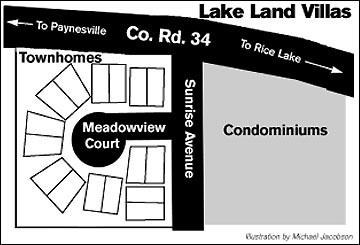 A new development - Lake Land Villas - was approved last week by the Paynesville City Council. The developers - Viking Land 'n' Lakes, a division of Ecklund and Swedlund Homes, Inc. - plan to build 16 townhomes and 20 adult condominiums along Co. Rd. 34 just inside the city limits. Last week, the city council approved a conditional-use permit for the development, approved rezoning the property, approved the development agreement, and approved the final plat. The developers can now advertise for bids and apply for building permits. Construction of the roads, curbs and gutters, and water and sewer lines could start next month, with construction of the townhomes beginning as soon as possible after that. Construction of the two condominium buildings, each with ten units, will likely begin in May or June, city administrator Steve Helget told the city council last week. The townhomes, built as twinhomes, will likely have two or three bedrooms and a basement each. The townhomes are meant for people of all ages. The condominiums will be adult only (age 55 and over). Each condominium will have two bedrooms, with the facility having a shared storm shelter. The final plat for the condominiums will not be drawn until after construction starts, since the condominiums will be owned individually. The developers agreed to share a walking trail between the development and Lake Avenue. One issue still undecided is how to handle stormwater for the new development. If the county allows the development to use the ditch along Co. Rd. 34, stormwater could be directed to the city's retention pond along Lake Avenue. If not, the developers have agreed to build a retention pond, possibly in the northwest corner of their property. Developers have not given Helget a price range for their homes yet.